A prize-winning journalist’s quest to uncover the hidden history of his remarkable American family, part black and part white—all descended from an African slave who won his freedom in the Jamestown court in 1672, one of the country’s first free black men. “My dad’s family was a mystery,” writes prize-winning journalist Joe Mozingo. Growing up, he knew that his mother’s ancestors were from France and Sweden, but he heard only suspiciously vague stories about where his father’s family was from—Italy, Portugal, the Basque country. Then one day, a college professor told him his name may have come from sub-Saharan Africa, which made no sense at all: Mozingo was a blueeyed white man from the suburbs of Southern California. His family greeted the news as a lark—his uncle took to calling them “Bantu warriors”—but Mozingo set off on a journey to find the truth of his roots. He soon discovered that all Mozingos in America, including his father’s line, appeared to have descended from a black man named Edward Mozingo who was brought to the Jamestown colony as a slave in 1644 and won his freedom twenty-eight years later. He became a tenant farmer growing tobacco by a creek called Pantico Run, married a white woman, and fathered one of the country’s earliest mixed-race family lineages. But Mozingo had so many more questions to answer. How had it been possible for Edward to keep his African name? When had some of his descendants crossed over the color line, and when had the memory of their connection to Edward been obscured? The journalist plunged deep into the scattered historical records, traveled the country meeting other Mozingos—white, black, and in between—and journeyed to Africa to learn what he could about Edward’s life there, retracing old slave routes he may have traversed. The Fiddler on Pantico Run is the beautifully written account of Mozingo’s quest to discover his family’s lost past. A captivating narrative of both personal discovery and historical revelation that takes many turns, the book traces one family line from the ravages of the slave trade on both sides of the Atlantic, to the horrors of the Jamestown colony, to the mixed-race society of colonial Virginia and through the brutal imposition of racial laws, when those who could pass for white distanced themselves from their slave heritage, yet still struggled to rise above poverty. The author’s great-great-great-great-great grandfather Spencer lived as a dirt-poor white man, right down the road from James Madison, then moved west to the frontier, trying to catch a piece of America’s manifest destiny. Mozingos fought on both sides of the Civil War, some were abolitionists, some never crossed the color line, some joined the KKK. Today the majority of Mozingos are white and run the gamut from unapologetic racists to a growing number whose interracial marriages are bringing the family full circle to its mixed-race genesis. Tugging at the buried thread of his origins, Joe Mozingo has unearthed a saga that encompasses the full sweep of the American story and lays bare the country’s tortured and paradoxical experience with race and the ways in which designations based on color are both illusory and life altering. The Fiddler on Pantico Run is both the story of one man’s search for a sense of mooring, finding a place in a continuum of ancestors, and a lyrically written exploration of lineage, identity, and race in America. As I listened to the dry rasp of the elephant grass, I gazed out over the Kingdom of Kom. A narrow gorge threaded through the lush terrain below, opening into a smoky blue chasm in the distance, the Valley of Too Many Bends. . . . This belt of fertile savannah in western Cameroon rested at a terrible crossroads, with no forest to hide in when the marauders arrived. The kings may have been safe in their fortified isolation, but their people were not. They were taken first by Arab invaders in the Sudan in the north, and then by the southern peoples who found that humans were the commodity Europeans most desired. . . .
Those who survived had been handed from tribe to tribe, through too many hostile foreign territories to dream of escaping and returning home. And then off they went, into the sea. High on a ridge, three hundred miles by road from the Atlantic, I sat at the headwaters of that outward movement, imagining the people flowing away like the rivers below. I pictured a boy, gazing down into that blue mountain cradle, the grass dry-swishing in the breeze, the drums coming up in the night. A boy suddenly pulled into the current and scrambling to reach the bank. A boy unable to imagine the ocean and sickly white men in big wooden ships and the swampy, malarial settlement called Jamestown where he would be sold to a planter in the year of their lord 1644. This is the beginning, I said to myself. The beginning of my family’s story, the point just after which my forebears obscured the truth—and nearly buried it forever. 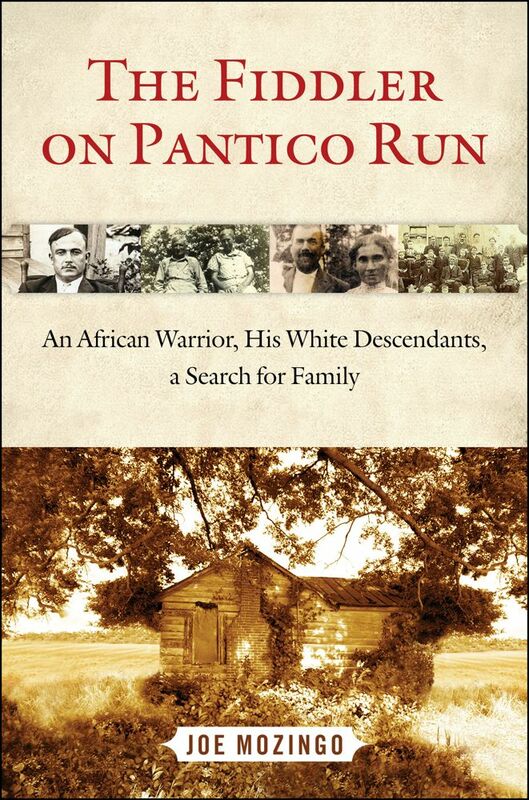 "[The Fiddler on Pantico Run] is a fascinating, highly detailed book, which raises difficult questions about ancestry, identity and race...When you read this amazing book, it will stagger you." “A powerful book. . . endearing and honest . . .profound. . . I was moved by this book and Mozingo’s thoughtful prose"